Maybe Donald Trump will "take a question here and there" while he is on the campaign trail, campaign manager Kellyanne Conway said Tuesday night. But if there's a plan in the works for more interviews by the GOP nominee, Conway is not telling. In an interview with CNN's Erin Burnett on Tuesday night, Conway seemed to equate Trump rallies with real interviews. "He gives press availability every day by doing these rallies, in these swing states, where he is every single day," and Trump's traveling press corps "are there with him," Conway said. The rallies are open to the public, she noted, "and the press is right there to cover everything." However, there is a big difference between covering what Trump says on stage and actually asking him questions. 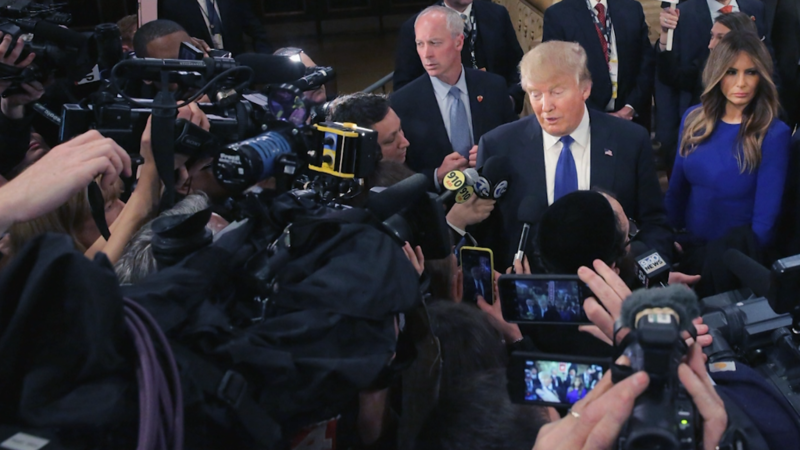 Trump beat reporters say access to the candidate has become much more limited in recent months. "Trump used to be very, very accessible to the press. At the beginning of his campaign, he was extremely accessible," CNN politics reporter Jeremy Diamond said on Sunday's "Reliable Sources." "You could catch him for quick interviews on the way in and out of rallies. And that has really changed." Diamond said "he is less accessible I think, in many regards, than Hillary Clinton at this point." Clinton went more than eight months without holding a full-fledged press conference earlier this year — a fact that turned into a talking point by Trump officials and the Republican National Committee. But the campaign's media strategy changed this month. Clinton has taken questions from reporters at half a dozen press conferences in the past two weeks, including as recently as Monday. Speaking with Burnett on Tuesday, Conway slammed Clinton beat reporters for tossing her softballs. "They might as well just ask her, 'Lovely blouse, where did you get it today, Mrs. Clinton?' Some of these questions are not journalism," Conway said. A review of transcripts shows that the reporters at Clinton's press events have asked many probing questions. On Monday, these included questions about the recent bombing in New York City, how her handling of lone-wolf attacks would differ from President Obama's; and potential Russian interference in the election. Conway also contrasted Trump and Clinton this way: Trump is "at public places at rallies with voters, not at fundraisers where cameras are not allowed like she does constantly." Lesley Clark, a White House correspondent for McClatchy, tweeted that Conway's assertion is "not true, he left press Fri + Sat for at least 3 fundraisers." Conway's broader complaint on Tuesday was that Trump's traveling press corps are too critical of the candidate. "A lot of the people who travel with us don't give us a positive tweet, don't give us positive stories," she said. She described Monday's "incredible" jam-packed Trump rally in Fort Myers, Florida, and said "you don't get these stories from the whole press pool." Trump's trip to Fort Myers was widely covered. Many of the pool reporters took panoramic photos of the large crowd. Conway also said "we don't get fair questions" from the press corps. On Tuesday, members of the traveling press tried to ask Trump when he changed his mind about President Obama's citizenship. He did not respond to the shouted questions. Members of Trump's campaign sent slices of cherry cobbler to the reporters who were nearby. "Trump grinned at us and pointed to the box as it was delivered," Bloomberg's Jennifer Jacobs tweeted. Then she sent a tweet to Trump saying "Thank you kindly for the cherry cobbler... Can we come thank you in person? (And ask a couple questions?)" Her tweeted plea was unsuccessful. Conway has been more accessible to interviewers than Trump has. Speaking with Burnett on Tuesday night, she objected to an on-screen graphic from Monday that said "TRUMP SAYS 'RACIAL PROFILING' WILL STOP TERROR." "Your network added in 'racial' to make it look like he had said 'racial profiling' where he never had," Conway said. Burnett responded: "That was a lower third, as we call them, on our screen. I want to make it clear, the word 'racial' should not have been put in quotes." On the campaign trail, Trump has reiterated his support for racial profiling by police while talking about threats from Islamic terrorists. He has not been asked about his position in detail because he has severely limited interviews. Trump is saying "yes" to Fox News almost every day but saying "no" to most other major networks and news organizations. He called into "Fox & Friends" on Monday morning, joined "The O'Reilly Factor" Monday night, and has another town hall with Sean Hannity on Wednesday. But interviews with non-Fox outlets are rare. Most of them "are with local affiliates," CBS News journalist Sopan Deb, a Trump campaign trail veteran, tweeted on Tuesday. Rousing the base instead of reaching out to undecided voters may ultimately pay off for Trump. If nothing else, it limits the candidate's exposure to hard-hitting questions -- while fueling frustration among journalists. Trump's surrogates continue to say that he is more accessible than Hillary Clinton, but that is no longer true.